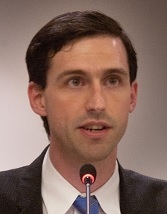 Matthew Bolton is Associate Professor of Political Science and Director of the International Disarmament Institute at Pace University in New York City. He has a PhD in Government and Master's in Development Studies (Research) from the London School of Economics, where he researched the politics of foreign aid for demining in Afghanistan, Bosnia and South Sudan. He has worked as an aid worker, researcher and journalist in 15 countries, including Haiti, Iraq, Kenya, Uganda, Bolivia and the Philippines. Dr. Bolton was on the information and analysis team of the Control Arms coalition during the Arms Trade Treaty negotiations and is the Membership Secretary for the International Committee for Robot Arms Control (ICRAC), a founding organization of the Campaign to Stop Killer Robots. Since 2014, Bolton has worked on the UN advocacy of the International Campaign to Abolish Nuclear Weapons (ICAN), recipient of the 2017 Nobel Peace Prize. "Using the Arms Trade Treaty to Address Pastoralist Conflict and Wildlife Crime in Kenya’s Marginalized Regions," May 2018. "The humanitarian impact of drones" (editor), Reaching Critical Will, Oct 2017. Maridhiano Mashinani "Reconciliation at the Grassroots: Reflections on the Role of the Church in Building Sustainable Peace in the North Rift Region of Kenya," May 2017. "The Role of Education in Advancing Arms Trade Treaty Universalization and Implementation: Lessons Learned from ATT Academy East Africa 2016-2017," May 2017. "Le Rôle de l’Éducation dans l’Avancement de l’Universalisation et de la Mise en Oeuvre du Traité sur le Commerce des Armes: Enseignements tirés de l’Académie du TCA en Afrique de l’Est, 2016–2017," May 2017. "Comment Utiliser le Traité sur le Commerce des Armes Afin de Cibler La Violence Armée au Sein des Communautés Pastorales," March 2017. "How to Use the Arms Trade Treaty to Address Armed Violence in Pastoralist Communities," Control Arms and Pace University, March 2017. "How To Use the Arms Trade Treaty to Address Wildlife Crime," Sept 2016. "Comment utiliser le Traité sur le commerce des armes pour cibler la Criminalité liée aux espèces sauvages," Sept 2016.